Pesticides and Pollinators - A look at Modern Neurotoxins (ppt file)- Slide presentation by Gary Rondeau prepared for 2014 SAVE the BEES event. ppt file has comment for many slides that will aid in understanding the presentation. PDF version does not have comments. In the wake of two recent bumblebee die offs in Eugene and Portland resulting from pesticide poisoning, it is especially important to report suspected pesticide poisonings to the Oregon Department of Agriculture. If you are a beekeeper who finds more than 50 dead bees in any single area or colony, contact the Oregon Department of Agriculture: pestx@oda.state.or.us or (503) 986-6466. Two years ago I made poster for our educational bee event called Keeping our Bees Alive – The Challenges. At that time we knew that the neonicotinoid insecticides were likely a big problem, but we had a hard time figuring out why sometimes the bees seemed to tolerate the pesticides and other times bee colonies with a modest exposure could collapse. The multi-factor nature of the problem was apparent, and is illustrated in that poster. This year I concentrated on what we have learned in the last two years that can help us solve the colony collapse puzzle. This year, Pollinator Peril – Reserach Highlights presented research that shows how the neonicotinoids interact syynergiysticly with common bee pathogens, making the bees much more suseptible to natural diseases. This research goes a long way to explaining why there can be such a variable response to neonicotinoid exposure, since it is usually the pathogens that kill the bees in colony collapse, not the neonicotinoids directly, and the pathogens need to be present as well as the insecticide for devestating losses. Live links to the original research and referenced papers are provided below. 1.Aufauvre J, Biron DG, Vidau C, Fontbonne R, Roudel M, et al. (2012) Parasite-insecticide interactions: a case study of Nosema ceranae and fipronil synergy on honeybee. Sci. Rep. 2: 326. 4.EFSA. 2013.Conclusion on the peer review of the pesticide risk assessment for bees for the active substance imidacloprid . EFSA J 11:3068. 6.Gill RJ, Ramos-Rodriguez O, Raine NE (2012) Combined pesticide exposure severely affects individual- and colony-level traits in bees. Nature 491: 105-108. 8.New York Times, March 29, 2013. Mystery Malady Kills More Bees, Heightening Worry on Farms. 9.New York Times, January 29, 2014. Migration of Monarch Butterflies Shrinks Again Under Inhospitable Conditions. 11.Rondeau G. (2013) Time-dependent toxicity of imidacloprid on bees and ants. 12.Tennekes HA, Sánchez-Bayo F. (2013) The molecular basis of simple relationships between exposure concentration and toxic effects with time. Toxicology 309:39-51. Send a message to the Environmental Protection Agency through this Pesticide Action Network campaign to get EPA administrator Gina McCarthy to ban “neonics” now rather than waiting until 2018, which is the current plan. The data is there: there is no reason to let bees and native pollinators continue to die for the next four years. Eugene’s City Council Wednesday night voted to ban the use of neonicotinoid pesticides on city property. Council Resolution 5101 also expands the current Pesticide-Free Parks program and requires all city departments to adopt the same IPM standards and protocols as the City’s Parks and Open Space Division. The Eugene City Council resolution, the only one of its kind in the nation, passed by unanimous consent in a council work session. The language of the resolution specifically includes a strong concern for children’s health as well as protecting bees and a host of other pollinators in Eugene’s environment. Click here is the text of the ordinance. Now if we could only stop selling neonics as well: but there are steps in the right direction. This past Monday, February 24, the Save Oregon Pollinators Act (HB 4139-3 amended) passed 27-2. The bill now goes to the Governor’s desk where he is expected to sign it into law. Important: The bill requires all pesticide applicators to take a course and pass a test on Bee Health and Pesticides, and establishes a Task Force instructed to bring further bee protection legislation to the 2015 Legislature. Thus the bill takes proactive steps to prevent pesticide operators’ performing uneducated acts of label violation like that which killed 50,000 bumblebees in a mall parking lot in which linden trees were sprayed while in bloom last year. Jerry’s Home Improvement Center in Eugene responded to concerns of beekeepers regarding the sale of neonicotinoid insecticides by examining the data and taking action– placing products containing these pesticides on the back shelves of their garden area, along with pamphlets outlining the dangers of these pesticides to pollinators. Thank you to locally owned Jerry’s! We need more responsible home and garden retailers to follow their example and that of retailers in the UK who refuse to sell these pesticides. A study by University of Maryland and US Department of Agriculture researchers just published in PLOS ONE indicates that fungicides in pollen weaken the ability of honeybees to withstand nosema–thus making honeybee colonies more susceptible to Colony Collapse Disorder. 1) Bees are made susceptible to colony collapse disorder by foraging pollen in crops NOT directly sprayed with pesticides, but with low levels of several different pesticides resulting from drift. Thus saving our bees demands more stringent spray regulations than those currently in practice. 2) Fungicides, which had been assumed to be harmless to bees, weaken bees’ immune systems even with very low exposure. Far from being harmless, they are a key player in colony collapse. 3) It is difficult to pin the cause of colony collapse disorder on a single toxin because modern bees are regularly exposed to a large number of pesticides in the pollen they forage– with complex synergistic effects. Since PLOS ONE is an open access journal, you can review this essay and its data at the link above. In order to save our honeybees, we need not only to get “neonics” out of our pesticide arsenal, but radically cut back on fungicide use. This is a special challenge in the Pacific Northwest given our wet climate– but the survival of our bees, both native and honeybees, demands it. Over the course of the last year, the issue of bees and the neonicotinoid pesticides has finally begun to appear in the popular press in this country. A campaign by Friends of the Earth in the UK resulted in major garden center chains removing the neonics from their shelves in February of last year. Early spring found US beekeepers with another year of severe winter losses, with thousands of colonies dead on arrival into the California almond orchards. Then in April, the European Union made the decision to ban three of the most troublesome chemicals throughout the EU. Relying on the precautionary principle and the mounting evidence implicating these chemicals, science and politics came together in Brussels and put these poisons on hold — but not without dissent. The major chemical manufacturers, Bayer and Syngenta, predict dire consequences for European agriculture. The UK representatives voted no to the ban being imposed upon them by the rest of Europe, despite the groundswell of popular support for a ban on the chemicals. Meanwhile, in the US, after the disastrous bee losses during almond pollination, the EPA held a “Pollinators Summit” to address the plight of the bees. But the “summit” was just a love fest for the chemical companies. The day of testimony, there were four times as many presentations justifying pesticide technology than there were talks on the plight of the bees. Indifference at the EPA has meant that the only way to get their attention was to sue them, so that is what happened in July over the approval of yet another systemic pesticide, Suflaxofour, that was granted approval without adequate testing. Here in Eugene, Oregon, we started our early spring fair weather with a noticeable dearth of honeybees. I lost all of my bees over the winter, and, coming into spring, it appeared that bee numbers were down all around town. With the handwriting on the wall in Europe, activists began to step up pressure on local retailers and the city to get rid of the neonics. The City of Eugene has been responsive, and has ceased using neonicotinoids to maintain city plantings. Petition campaigns and several rallies for the bees eventually persuaded two local retail establishments to include warning literature and reduce their sales efforts for the worst neonics, a small but significant victory. During the summer, a major bumblebee kill in Wilsonville, Oregon was caused by spraying of the neonic dinotefuran on blooming linden trees. With tens of thousands of dead bees littering the parking lot, the bee kill generated national attention and refocused local efforts to restrict use of these potent chemicals. The Oregon Department of Agriculture (ODA) issued a six-month moratorium on the use of dinotefuran pending further investigation. Summer comes, the bees do better in the nice weather, and everyone gets complacent. Last week, Mike Odenthal , pesticide investigator for the ODA was trying to make excuses for the pesticide applicator that killed the bumblebees because the spraying was done at 6 AM before bees were flying. This begs the question of why the ODA could allow such lax rules in the first place. Then, Beyond Toxics, having collected more than 12,000 signatures from Oregonians on a petition asking the ODA to consider further restrictions on the neonics, received the cold shoulder from ODA. Nothing has come from the EPA except statements that they are due to consider review of some of the neonics in 2018. Fortunately, the bee researchers have still been at work. The real problem with the neonicotinoids became apparent to me after reading a 2009 paper by Francisco Sanchez-Bayo which looked at the effect of toxic chemicals over time. The lesson was simply that some compounds could have delayed toxic effects, and at least for some organisms, the neonicotinoid imidacloprid demonstrated a strong time dependence. Earlier this year Sanchez-Bayo and Tennekes expanded on the earlier results and showed that strongly binding toxins, such as imidacloprid and other neonics, are likely to have a larger delayed toxic effect. 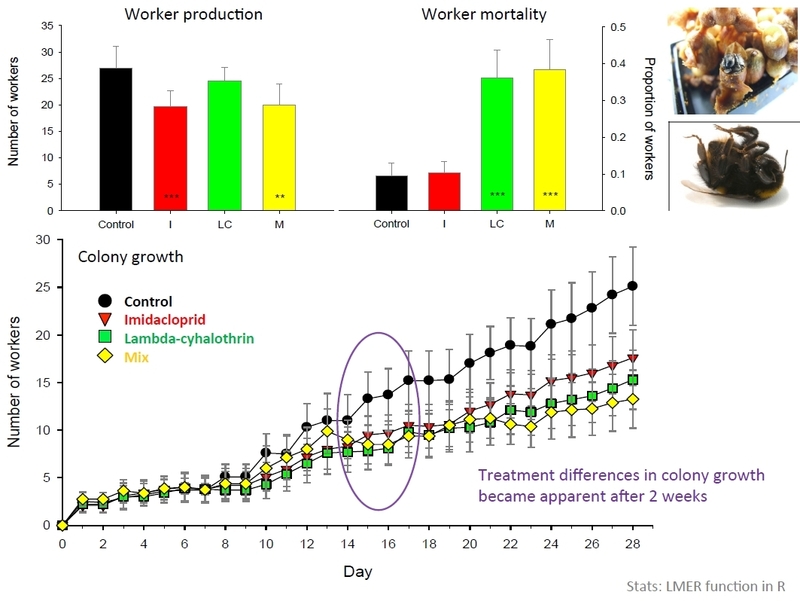 I looked at a compendium of published papers on imidacloprid toxicity to honeybees and found that you needed less insecticide if you wait longer for the insects to die and the lethal concentrate will vary as 1/ t2 as you wait longer for the effects to accumulate. A very good study on bumblebees by Gill et al. showed that indeed, field realistic exposure levels (<10 ppb) of imidacloprid did effect bumblebee colony development. Significant effects did not show up until two weeks into the experiment, which goes along with the argument the that time dependent nature of the imidacloprid toxicity is a crucial variable. From Nigel Raine talk 8/13 – Gill et al. paper. Most recently, a paper by Prisco et al. out of Italy demonstrated a mechanism for immune suppression by the neonicotinoids clothianidin and imidacloprid in honeybees. 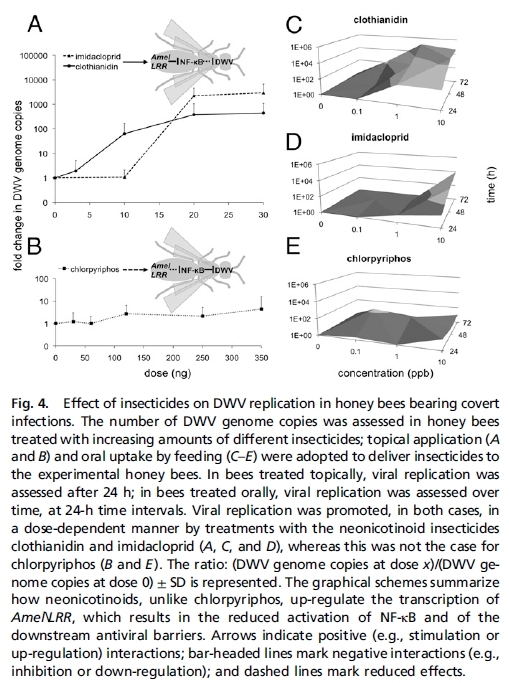 They went on to show that for one of the common known bee viruses, deformed wing virus (DWV), bees exposed to the neonicotinoids had further replication of the virus in their bodies, while in unexposed insects the virus did not replicate in the adult bees. This mechanism for downgrading the immune system by the neonics goes a long way to explaining the observed general bee malaise and problems with multiple pathogens that are ultimately killing colonies. From Di Prisco et al., PNAS Oct. 2013. Despite the growing evidence against these chemicals, we face an uphill fight to get them banned. The pesticide industry is a $45 billion giant with lobbyists in every state house and marketers filling the airwaves with greenwash. Bayer and Syngenta have programs promoting “bee health” while churning out tons of the offending chemicals. University Ag schools receive industry funding, which colors their decisions regarding what research is suitable if they wish to stay on the gravy train. Politicians get campaign contributions from corporations, and are expected to fall in line. In many places, including Oregon, government agriculture departments emphasize chemical farming. In Oregon, the ODA is also supposed to protect us from misuse of pesticides — it’s not our department of environmental quality (DEQ) that has that role. This inherent conflict of interest is currently showing its horns in Oregon. How can the ODA, an agency that is part of the part of the American experiment in corporate mono-culture, manage to look itself in the mirror and question the chemicals that it normally promotes? Next spring we will undoubtedly have another crisis in the almond orchards. The science will increasingly point the finger at the neonicotinoids, and the popular press and the public will continue to raise the alarm. The responsibility for the insect genocide rests with all of those that have the ability to do something about it. Let’s start at the top with the EPA, and then our state equivalent the ODA. But don’t stop there. Our state legislature can mandate action, so all of our representatives are on the hook, as are all of the retail establishments that sell these products and all of the pesticide applicators who use them. But as is often the case when power and money are involved, it will only be grass roots activism that eventually gets the job done. individual- and colony-level traits in bees. Nature 491: 105-108. Tennekes HA, Sánchez-Bayo F. 2013. The molecular basis of simple relationships between exposure concentration and toxic effects with time. Toxicology 309:39-51. Pettis J, vanEngelsdorp D, Johnson J, Dively G. 2012. Pesticide exposure in honey bees results in increased levels of the gut pathogen Nosema. Naturwissenschaften 99:153-158.